Yeah, we're suffering from Michael Jackson fatigue, too, but some of the peripheral weirdness is tough to ignore. — Profiles In History, a seemingly classy-ish joint that sells a lot of rare pop-culture memorabilia, will auction off the glove you see above. 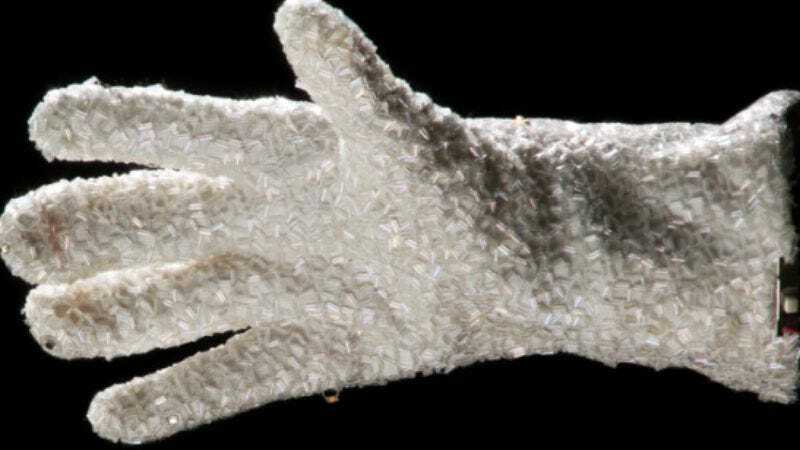 From their press release: "The glove, the single most iconic piece of Michael Jackson memorabilia in the world, was specially designed by Ted Shell of Ted Shell Designs in 1984 and is emblazoned with bugle beads and Austrian crystal rhinestones and fitted with 50 small lights powered by a single 9v battery placed in the cuff of the glove. The glass light bulbs were wired on separate circuits making them twinkle at random for added visual impact on stage. The glove, along with several other Michael Jackson items will be available as part of Profiles in History's next auction, set for October 2 and 3, 2009." — New York Magazine's Vulture blog has a PDF of part of Jackson's will, which specifies that custody of his children should go to his mother, and if she's not willing or able, to Diana Ross. — TMZ (you know, that website where they stand around pitching paparazzi stories at each other all day?) has the whole thing, and you can even download it. What a keepsake! Is that the last you'll be hearing from us about MJ? Probably not. Below, for those of you not interested in the Jackson saga, is a list of some of Profiles In History's other auctions. "Prior Profiles in History Hollywood auctions highlights include the "Cowardly Lion" costume from The Wizard of Oz ($805,000); a full-scale model T-800 Endoskeleton from Terminator 2: Judgment Day ($488,750); a King Kong six-sheet movie poster ($345,000); the Command Chair from the "U.S.S. Enterprise" ($304,750); the original "Robot" from Lost in Space ($264,500); Luke Skywalker's lightsaber ($240,000), the Black Beauty car from The Green Hornet ($192,000); George Reeves' Superman costume from The Adventures of Superman ($126,500); the H.R. Giger designed Alien creature suit from Alien ($126,500); a full-scale T-Rex head from Jurassic Park ($126,500), the Leaping Alien Warrior figure from Aliens ($126,500), Christopher Reeve's 'Superman' costume from Superman: The Movie ($115,000), C-3PO's helmet ($120,000), The Wizard of Oz 'Winkie' Guard Costume ($115,000); a "Ming the Merciless" cape from Flash Gordon ($115,000) and the Hydraulic screen-used Velociraptor from The Lost World: Jurassic Park II. ($115,000)."